Shiny new beer and whisky bar Boilermaker snuck onto Staunton Street with very little fanfare, appearing almost like it was there all along. That is, it’s a good fit. The front of the bar, like most of its neighbours, opens invitingly onto the pavement and high stools and tables dot the venue, which has a reasonably small bar. The interior is rustic meets industrial chic – we imagine it would be quite cosy come winter. Exposed filament light bulbs on copper pipes give the bar a warm orange glow that, if a tad dimmer, would create a better ambience. Walls are exposed brick and drinks are served on thick cuts of log acting as coasters. Onto one of life’s greater pairings, beer and whisky – or boilermakers, hence the name. Whisky-wise, it’s mostly scotch with a couple of options from Ireland and Japan. On the beer side, there’s six local brews and three international additions, with tasting sets for both whisky and beer available. 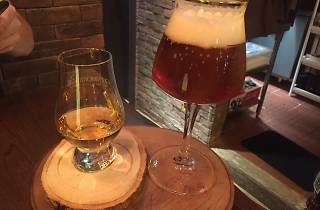 We opt for the Monkey King amber ale ($60) and Teeling whisky ($180), with this particular Teeling being a small batch aged in rum casks. It’s a beautiful, smooth dram with a soft but full-bodied vanilla aroma that encompasses the palate. There’s a definite spice from the rum casks and the apple pie hints make this dreamy dram dessert-like in its finish. The beer - from the Moonzen brewery in Kwun Tong - is a gorgeous shade of reddish amber. There’s fruity pomelo notes with a saltiness at the front but it’s nicely rounded out but a blanket of caramel. There’s also a pretty robust food menu with no apparent theme, but it looks tasty and we order the lamb kofte with mango ‘sa sa’ sauce ($98). They’re serviceable but nothing to shout about. 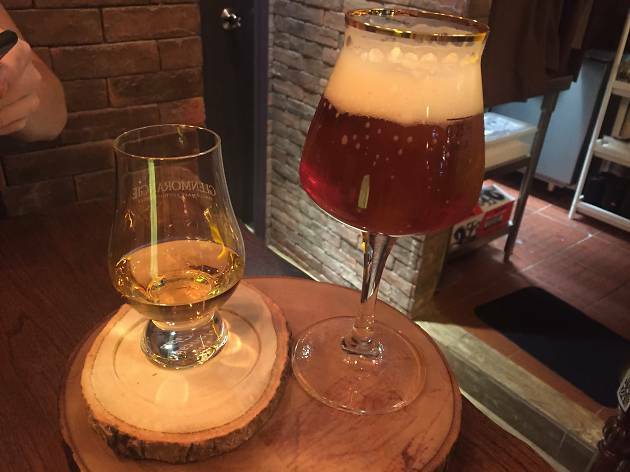 Whilst this smart looking bar serves some good beer and whisky, we feel that – while being super-friendly – the service would benefit from pairing recommendations to really bring home what this bar is all about. We hope to see the menu expand and for Boilermaker to really own, well, boilermakers. We stopped by on a whim, and really enjoyed it. I ordered the boilermaker with local beer, and selected a stout. The bartender paired it with a blended Scotch, brought the bottle to the table and explained why he'd chosen it for pairing, then left the bottle with us for obligatory photos. My husband loved the extensive whiskey menu, and our friend tried a tasty new brew. The (very new) waitress was delightful and welcoming, and the bartender very hospitable. I wish I lived closer (San Francisco is an unfortunately long commute), as I would happily be a regular here.